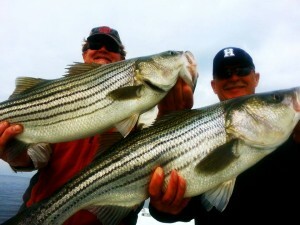 One of the more frequently asked questions I get whether by email or in person is, “How can I consistently catch bigger fish?” I’ve written about moving your game up to the next level before, but since we now have some migratory stripers in the Maryland part of the Chesapeake Bay, it’s worthwhile to address it again. The learning curve gets a little shorter in the fall and it’s a great chance to sharpen your skills. I’ll start by saying there are no hard and fast rules for catching stripers. Over my years of casting for them I feel like I’ve honed my techniques so that, on any given day, I have an edge for catching a trophy. That said, I’m still frequently surprised when a huge striper is caught by some completely different method than I’ve seen before. One thing is for sure, things change. There’s no substitute for experience but anglers who aren’t willing to stay on top of the latest innovations and newest techniques are certain to be left behind. Big fish tip # 1: Everything matters. The first and most important element to consistently catching bigger fish on light tackle is to realize that everything – and I do mean everything – matters. 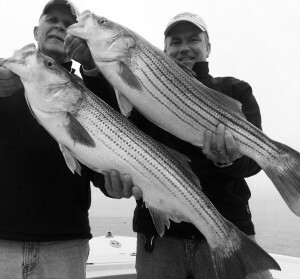 When it comes to hunting trophy striped bass, “good enough,” is never good enough. You have to be willing to go that extra mile and take those additional steps most anglers won’t. Details are important in every aspect of your fishing trip. Oh sure, sometimes it doesn’t matter. There are some days when fishing is good and fish seem to want to jump in your boat, but those are few and far between. There’s nothing I’d like better than to quit my job and chase hungry striped bass as they migrate up and down the Atlantic coast. 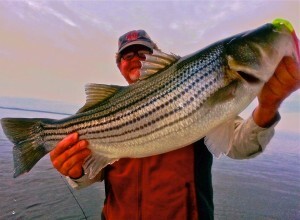 Unfortunately, I have to do the best I can with the finicky stripers I find close at home. That means I frequently have to pull out every stop to get them to bite. Once you realize that it’s the little things that make the difference, it’s easier to take your game to the next level. Big fish tip # 2: Get and stay organized. What do organization skills have to do with consistently catching big bass? Everything. How much of your time on the water do you spend looking for lures, or retying knots, or stepping around tackle? The best fishermen I know always have a lure in the water. A good rule of thumb is to keep your tools and equipment in the same place so you always know right where to go when you need something. Leader material? Mine’s always in a cup holder on the right side of the console. Scissors or nippers? Right beside my leader with another set hanging from the leaning post. Pliers? Always on the seat. Dehooker and Bogagrip? Hanging from the 3rd and 4th rod holder. The list goes on and on. I like to fish with partners who are equally organized. When I’m fishing on a partner’s boat, I make sure I have my gear in my tackle bag in the same place every time so I can just reach in and grab what I need without having to think about it. Organization matters because you want to be tied on and ready when you hit that first fishing spot and you don’t want to waste time looking for things during your trip. Every second your lure is in the water increases your chances. The seconds add up to minutes and minutes add up to hours and it all adds up to more and bigger fish. 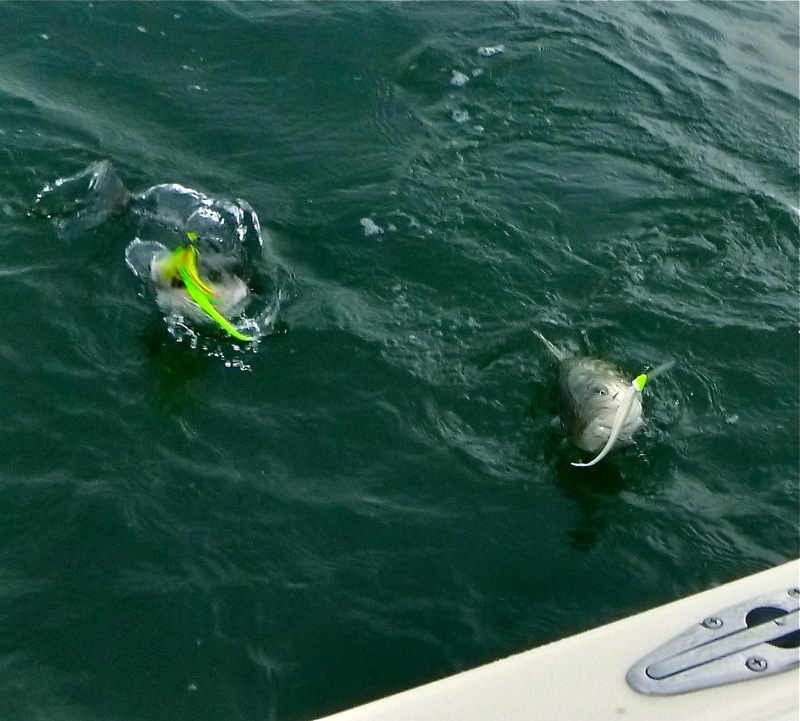 Big fish tip #3: Minimize terminal tackle. I still see guys, sometimes even experienced fishermen, using clips and swivels on their lures. They’ll tell you that they catch fish fine, but look at their results. Are they really catching big fish consistently, or is it that they’re hitting an occasional hunger bite where it doesn’t matter? Remember, we aren’t chasing easy ocean fish here. Clips and swivels on a jig reduce sensitivity, add resistance in current, increase the chance that a big fish will identify your bait as artificial, and provide another pressure point where your equipment can fail. Why take the risk? Big fish tip # 4: Tie good knots and retie frequently. A loop knot, an improved clinch knot, and a double uni; those are the knots I use most frequently and the ones I trust above all others. Every knot has advantages and disadvantages and there are other knots that are good. The important thing is to find the ones that work for you and learn to tie them quickly. Don’t forget to retie after a big fish and periodically even when you aren’t catching. Big fish tip # 5: Use big baits for big fish. Even a casual glance at any of my fishing reports will tell you that I usually cast soft plastic lures. The first lure out of my box is almost always a 6-inch Bass Kandy Delight (BKD). It’s very easy to find little fish feeding on glass minnows or bay anchovies this time of year, but it’s a little harder to find the fish that are eating bunker. When you find them, you don’t want to be throwing skinny little droppers or thin metal jigs. Go with the rubber and keep moving up to a bigger lure until the fish stop hitting it. If you’re on fish that will take a 10-inch lure, you’re chances are good for catching a real trophy. The same applies to topwater. Go big or go home. I would never consider a topwater lure less than 4 inches long in any Chesapeake Bay situation and I’m usually throwing a 5″ lure. Big fish tip #6: Be sneaky. 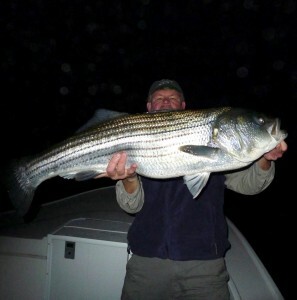 I’ve written chapters about this because it’s the biggest mistake I see Chesapeake Bay striper anglers make. To catch bigger, smarter fish you have to sneak up on them. Nothing alerts big stripers to the presence of fishermen like noise. When approaching a good fishing spot, it’s best to circle wide and kill the engine before you drift over the place where you think the fish might be. Talk softly, and step lightly in the boat while you’re fishing, even when you’re catching every cast. Be careful not to drop items on the floor, ease the motor into gear, and close hatches cautiously. 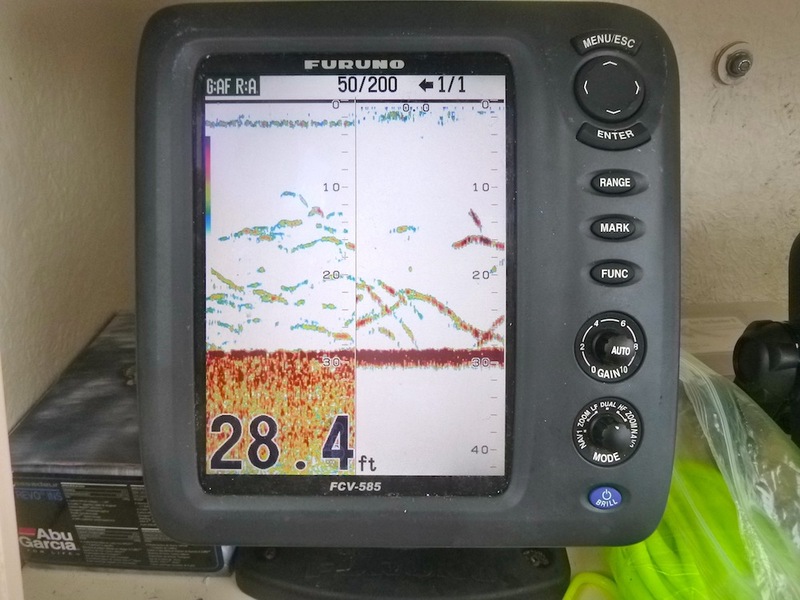 Some fishermen are so careful about noise that they turn off their sonar units when they know they’re over big fish since it’s been proven that fish can detect the pings. You can catch fish and even occasionally get a big one when you’re noisy, but your chances are a whole lot better when you aren’t. Big fish tip # 7: Move off little fish and keep moving until you find the big ones. When conditions are right for striped bass to bite in the Chesapeake, all sizes of fish will start to feed. Lately, it hasn’t been unusual to see a dozen or more pods of birds and breaking fish within easy binocular distance. Most of those schools are going to be small fish. Many anglers use the strategy of running from school to school looking for one with bigger fish. Some even set up and catch dink after dink hoping against hope that a big one might show up. You don’t have to do that. The trick is to identify a pattern. If the first pod of fish you encounter is small, look at your depth. Little fish are a lot more likely to school over shallower water. When big fish move shallow, it’s usually because they’re relating to structure. If you’re looking for birds in open water, your best bet is to check the underwater humps and ledges where the water is 20′ or deeper. That’s where the menhaden schools are more likely to hang out and where you’re more likely to find bigger fish. Another secret is to stay away from diving terns. Terns have small beaks so they can’t eat peanut bunker. They like much smaller bait fish. If you see terns mixed in with screaming gulls, chances are you need to keep moving. There’s more I can say but this is getting long so I’ll close by reiterating the first component – everything matters. 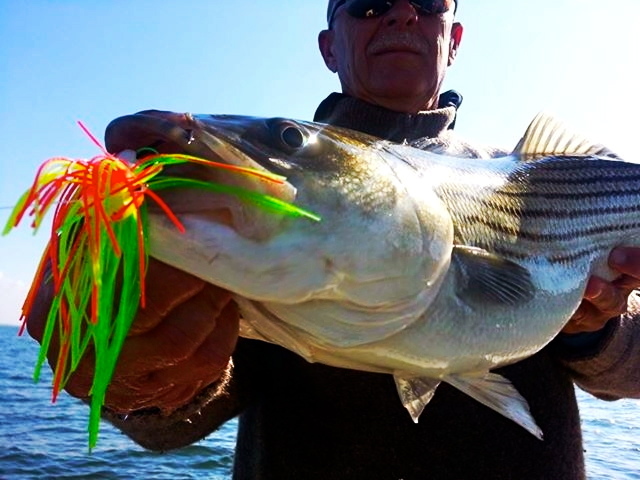 Here’s a list of 25 striper hacks I put together over the summer. How many of these do you incorporate into your fishing? I incorporate them all and I guarantee they work. 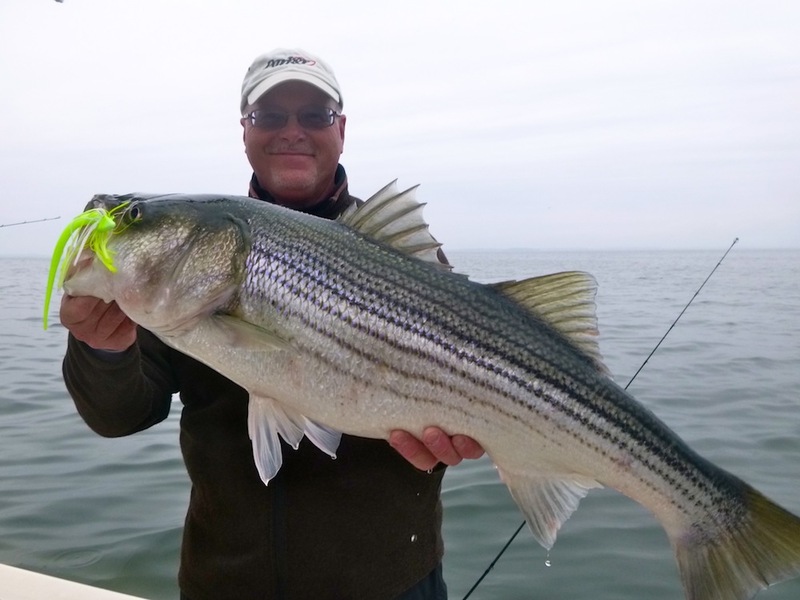 For the last couple of weeks we’ve seen a definite improvement in Maryland striper fishing. Water temps are in the mid-50s and in typical fall fashion, big fish are moving close to the mouths of the rivers and chasing peanut bunker. Thanks to my regular fishing partner Jamie Clough, I got out twice recently and we saw 30-inch-plus stripers on both days. The key is deep water. Bigger fish are hanging out in 25-30 feet and rounding up bait schools. Sometimes they’ll bring the bunker all the way to the surface, but mostly it’s just a wounded baitfish here and there to indicate the presence of feeding stripers. When the bait comes up, big birds swoop in and give away their location. Most of the eastern shore rivers are producing fish now, especially south of Kent Island. All the pictures in this report are of fish caught over the past two weeks. Nice fall rockfish are here. Go get ’em! Nice read Shawn always a pleasure having you on my boat..was a really great past 2 weeks..fish are getting more active each day on the beginning or ending of tides..
I’ve been marking some much bigger fish in the past few weeks. Especially last week. They’re slow to eat though. Sean. I love tip #2. Every glitter boat tournament angler lives by this creed. Shawn. I love tip #2. Every glitter boat tournament angler lives by this creed. Great summation of LTJ techniques on the Chesapeake – thanks. 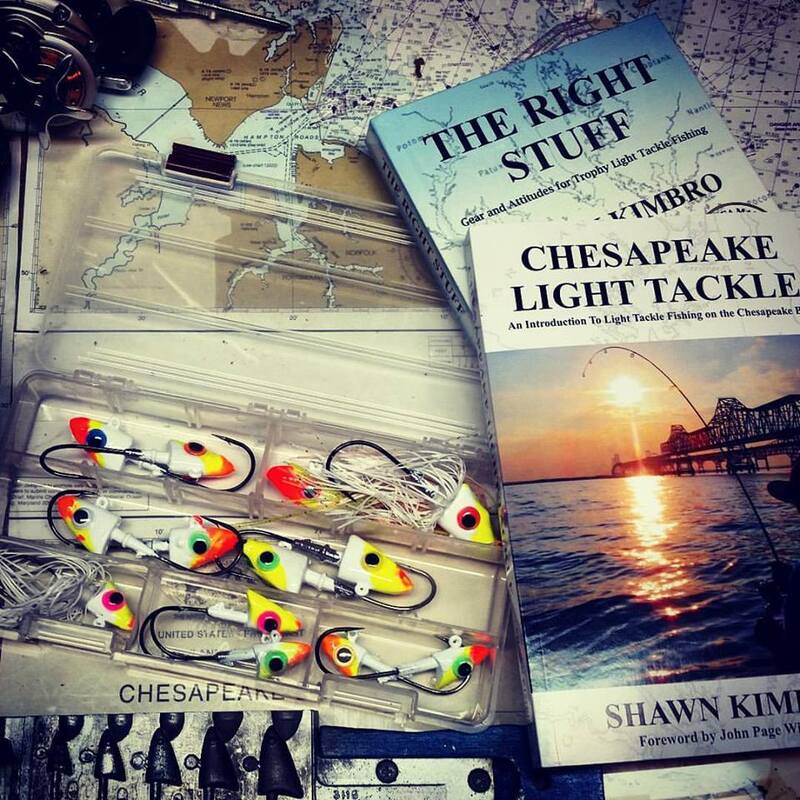 I’ve been in the area about 1 year now, learning the ropes and making the transition from a Southeast freshwater bass fisherman to chasing Stripers on the Chesapeake. Your book, this site, and Tidal Fish have shaved years off the learning curve. 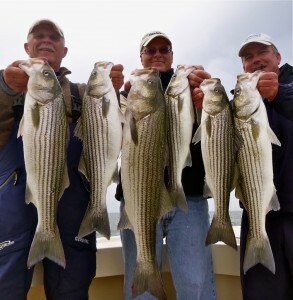 At least I think it has – I still have days like yesterday to puzzle me too often – on the water from Dawn until 1400 around mouth of EB, seeing many Stripers on the FF in several spots all day, jigging everything in the box, but only three hits all day. One dink, one 20″ that got off as my hand touched it, and what must have been the largest Striper I have ever hooked, as he jerked around a few times, then screamed off about 50 yards of my 15 lb PowerPro in just a few seconds, then was suddenly gone (Argghh!). Well it was a good load test of my equipment and knots, which held. Meanwhile, trollers catching fish all over. Well, next weekend looks good, and so there is at least one more chance at Fall redemption. Great read,Shawn.I like the skirted jig Idea. Been trying something similar but with bucktail. I tie sparingly with some Crystal flash and dyed Buck-tail hair,then just add a BKD. I bet Rich came up with that idea?